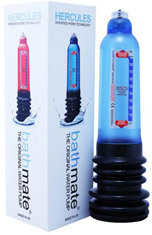 Bathmate Hercules is the first generation product which offers length of up to 7.08 inches with a diameter of up to 1.81 inches. Adds up to 2 inches in length. Increases girth by up to 40%. Instant visible results. Produces rock hard erection. Helps you last longer in bed. Works in the bath, shower or air. 95% success rate. 250% more efficient than air. Used by adult industry's professionals. Length 7.08 inches. Girth 1.81 inches. Weight 10 ounces. Body composite material Polycarbonate. Gaiter composite material skin safe rubber. Spring composite material stainless steel.